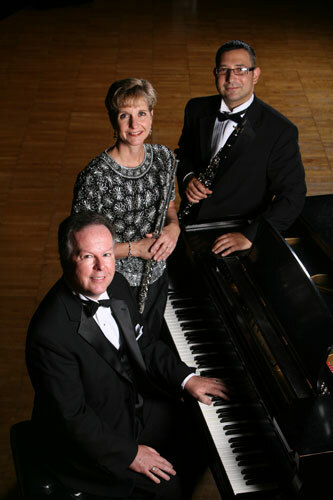 The Huntington Trio performers are Betsy Bobenhouse, flute, Pance Zaev, clarinet, and Larry Jones, piano. All three are music faculty members at Nebraska Wesleyan University. The trio’s name is in honor of D.W.C. Huntington, third Chancellor of Nebraska Wesleyan, who raised funds to complete the C.C. White Building in 1907, which housed the NWU Music Department until 1964 when the Rogers Fine Arts Center was built. The Huntington Trio performs during the academic year at Nebraska Wesleyan University and in the Lincoln community.